The Jacksonville Jaguars were 5-11 last season, and the team did what any team in similar circunstances would do: clean house. 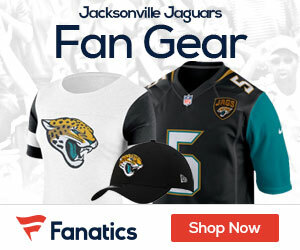 But if Week 2 of this season is any indication, the fans are avoiding Jacksonville Municipal Stadium like the H1N1 virus; you know it is not a good sign for the Jags when less than 47,000 (probably less, with 47,000 being generous) attend their home opener. And truth be told, who can blame them? While there is no shame in losing to the Indianapolis Colts (ask the Miami Dolphins, their most recent victims), it is hard to decipher how the Jaguars managed to roll over to the Arizona Cardinals last Sunday. And things didn’t get any better when it was announced that wide receiver Troy Williamson is oput for the year with a major shoulder injury. But back to the Arizona game for a minute. Call it a lack of focus or simply a case of home opener jitters, passes were dropped that would be caught otherwise. Case in point – the pass from quarterback David Garrard to Nate Hughes. Someone needs to tell Hughes that his hands were designed to catch footballs, not football helmets. Suffice it to say, it got big coverage on Sportscenter. Also throw in the illegal motion penalty against tight end Greg Estandia; the end result being that both Hughes and Estandia are now out of a job. So what do the Jaguars do? It seems to me that because Jacksonville is in such a sorry state of affairs this early in the season, that the next 3 or 4 games will tell the tale as to head coach Jack Del Rio’s future with the team; after all, when the going gets tough, management fires the head coach. But to be fair, it’s like that in all professional team sports. 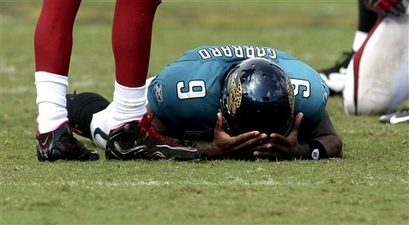 Could you imagine how bad the Jaguars would actually be if they didn’t have RB Maurice Jones-Drew? And it wasn’t that long ago when the Jags were 11-5 and even won a playoff game agaisnt the current Super Bowl champion Pittsburgh Steelers (2007, folks). Not even two years later, Jacksonville, with their ineptitude on the field and their apathy (47,000 allegedly attended the Arizona game) off the field, have the makings of a major makeover before this season is over. So if you catch an announcement here at Jaguars Gab announcing Del Rio’s firing or resignation, then you’ll know why.